“There has been a choir at Hereford Cathedral since the 13th century and there was an organ in situ by the 14th century ….The present Father Willis organ was built in 1892 and has been modified and renovated on several occasions Several influential musicians have held the post of organist over the years including John Bull; S S Wesley; G R Sinclair; and Meredith Davies. The current organist is Geraint Bowen, who has been in post since 2001. 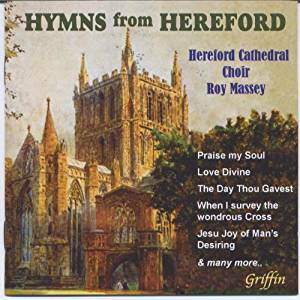 His predecessor was Dr Roy Massey, whose famous choir is heard singing a superbly crafted blend of familiar and rare hymns and carols”.